Soak the dried field beans in water for 12 hours and pressure cook with potato for 3-4 whistles. Remove from the heat and allow to cool. Drain the water completely. Chop the potato. Heat oil in a kadhai and temper mustard seeds. Add curry leaves, cloves, cinnamon and cumin seeds. Saute a while and add chopped onions. Fry till it turns golden brown. Add ginger-garlic paste and chopped tomatoes. Mash the tomatoes. 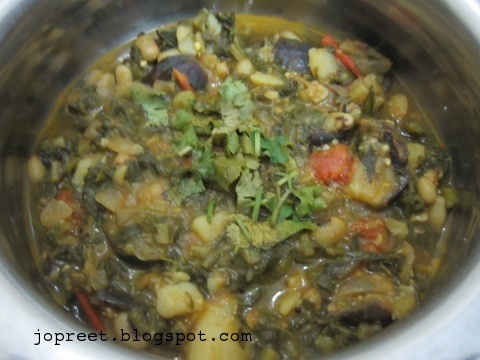 Add potato, brinjal, cooked field beans and finely chopped spinach. Mix all and add turmeric powder, chili powder, asofoetida, coriander powder and salt to taste. Add 1 cup water and cook it covered for 20 mins. Garnish with chopped coriander and serve hot with roti. Very healthy and delicious. Well done dear.